All of us share our yards and gardens with hundreds of bugs – some good, some bad and some ugly. But, which is which? Are damsel bugs good? What about lacewings and ground beetles? Dr. JC Chong, a “bug expert”, can help you easily distinguish between the good, bad and ugly. 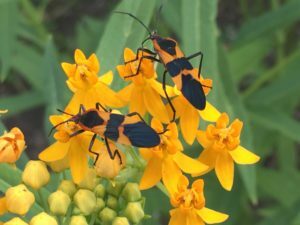 Learn everything you need to know about the bugs in your home landscape and how to take care of them. Join us on Saturday, March 9, 2019 from 10AM-2PM. The cost is $20 per person. Lunch is not included, so please bring your own. A microwave and refrigerator are available. Instructor bio: Juang Horng “JC” Chong is an Associate Professor and Extension Specialist of turf and ornamentals entomology at Clemson University. JC receives his BS in Ecology and Evolutionary Biology from the University of Arizona, and MS and PhD in Entomology from the University of Georgia. After his post-doctoral training under a joint project between USDA-APHIS and the University of Florida, JC joined Clemson University in 2007. For the past 11 years, JC has authored and co-authored 36 peer-reviewed papers, 90 extension articles, 8 book chapters and 12 pest management guides and documents.